We are extremely fortunate to have renowned Clare concertina player, Noel Hill as ‘Guest Tutor’ at this year’s Traditional Weekend. Noel has taken the concertina to stages throughout the world as an awe-inspiring performer and music teacher. Few musicians in any field or in any generation achieve a position where both audiences and experts agree on their preeminence and mastery of an instrument; Noel Hill’s virtuosity has firmly established him as the defining Irish concertina player of our time. 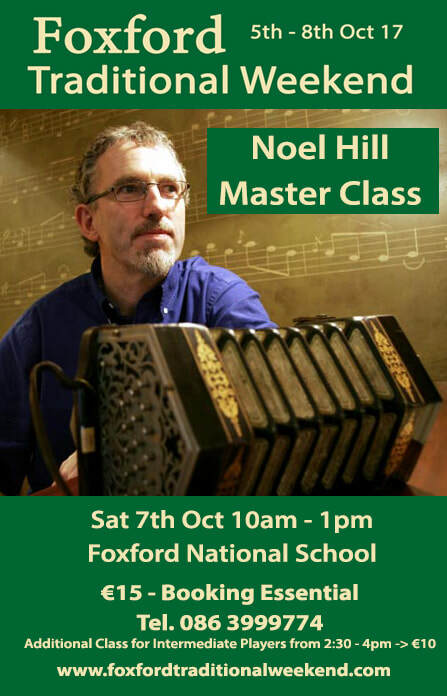 Noel will run a Concertina Master Class from 10am – 1pm in Foxford National School on Sat 7th Oct. This class is open to proficient musicians, who are well able to play reels and jigs by ear. Noel will also teach a second class from 2:30pm – 4pm in Foxford National School on Sat 7th Oct - this class is open to intermediate/advanced musicians who are well able to play a number of tunes on the concertina. Participants from the Master Class will get a chance to perform with Noel at the Sat Night Concert in the Mayfly Hotel. Three of our tutors feature in this clip recorded by TG4 at Fleadh Cheoil na hÉireann in Ennis this year - L-R Kevin Doherty, Stephen Doherty, David Doocey and Shane McGowan. The band 'Blás' also includes singer, Anne Brennan. The Master Class will focus on advanced players only and is open to all instruments. Multi-instrumentalist, David Doocey will guide participants through all aspects of group and stage performance with a focus on arrangement, technique composition etc. 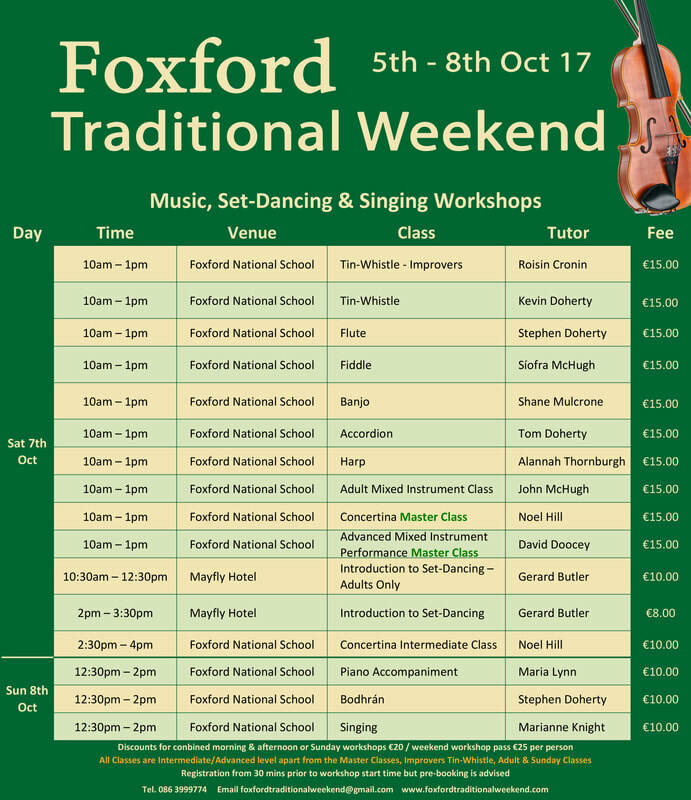 This Master Class takes place in Foxford National School on Sat 7th Oct from 10am - 1pm. Participants in this class will be asked to perform the arranged musical piece from the workshop, at the concert in the Mayfly Hotel on Sat night. 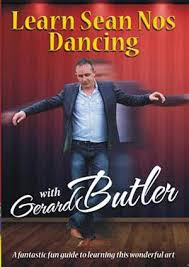 ‘Introduction to Set-Dancing’ with the talented Gerard Butler will take place in the Mayfly Hotel on Sat 7th Oct. The adults only workshop will run from 10:30am – 12:30pm and a combined workshop for adults and children will run from 2:00pm – 3:30pm. Registration for the workshops takes place in Foxford National School from 9:30am or in the Mayfly Hotel from 10am and 1:30pm. Places are limited so please pre-book. Come on, dust off your instruments, this might just be the push needed to get you back into the ‘ceol’. John McHugh will take the adults only, mixed instrument class. This class is open to adults who have a small amount of experience - perhaps they played music when they were younger, but did not keep it up, and realise now that their Mother was right! Discounts with pre-booking for combined morning & afternoon or Sunday workshops is €20. Weekend workshop pass €25 per person with pre-booking. All Classes are Intermediate/Advanced level apart from the Master Classes, Improvers Tin Whistle, Adult & Sunday Classes.